My first post will be about Fraisier, one of these delicious classic patisseries, composed of génoise, crème and fresh strawberries. The origin of this desert is actually unknown. Although well know Chef Auguste Escoffier, also restaurateur and culinary writer, has worked the strawberry in many different ways, he didn't actually create this desert; but someone might have been inspired by his work? So I decided to challenge myself with this patisserie. 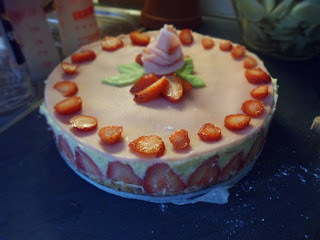 Fraisier was surprisingly easy to prepare! Here is the recipe, for 10 to 12 people, or 6 VERY hungry ones! You will also need a “cookie cutter” of 25cm diameter (even smaller or bigger is okay, the pastry will only be higher or lower). It can also be different shapes. Boil the milk with half the sugar, and vanilla. In a bowl, beat the eggs with the rest of the sugar until the mixture whitens. Add corn-starch. Pour boiling milk on the mixture and put back on stove, at lower temperature until it thickens. (Keep an eye on it, and stir so it doesn’t stick to the pot!) Then take off from stove and add half of the butter. Let it cool at room temperature and place in fridge. Start doing other steps. Pre-heat oven at 180°C (th.6). In an inox bowl (preferably) beat eggs and sugar. Then beat with electrical whisk for 10 minutes; the mixture should triple its size. Add flour delicately. Put the buttered circle on a tray that is covered with baking paper. Pour preparation in circle and bake for 10 to 12 minutes. Génoise must not get brown, you can cover it with baking paper to protect it if needed. Once it has cooled, take out of mold. Boil juice and sugar. Let cool. Spread the marzipan with a rolling pin (use icing sugar so it doesn’t stick to worktop) and use the circle to cut in the perfect size. Cut génoise in 2, horizontally of course. Pour crème mousseline on top and pack it nicely with the back of a spoon, so that it slides through the fruit. Save 3 or 4 tablespoons for the end. Soak the second half of genoise and place on top. Pack nicely so that cream comes from the side. Spread the rest of the cream to help stick the marzipan on top. Refrigerate for minimum 6 hours. Unmold helping yourself with a knife on the outside and decorate with strawberries and extra marzipan. Bravo bravo! I confirm that it was ultra-delicious!